A lovely 925 silver pendant, holding a golden Bronzite cabochon. 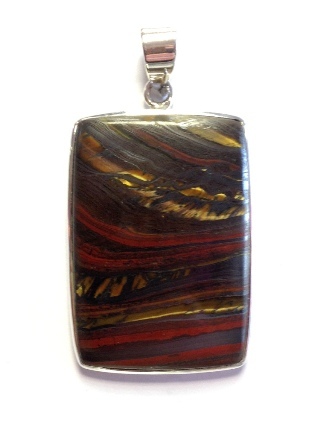 Tiger Iron is a combination of Tiger's Eye, Red Jasper and Hematite. Tiger Iron is a combination of Tiger's Eye, Red Jasper and Hematite, and brings you a balance of the Fire and the Earth element. Helping us get through a time that feels like daily struggle, Tiger Iron offers stamina, courage and determination.